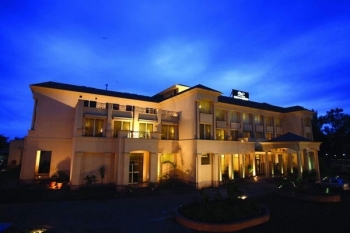 Ambrosia Sarovar Portico is a 4 Star hotel situated on the Haridwar - Roorkee highway. The hotel attracts both leisure travelers and business travelers. It is easily accessible and equipped with state-of-the-art facilities which can lure discerning travelers. The hotel offers 70 luxuriously furnished rooms and suites. Each room is appointed with modern amenities. The hotel also provides special banquet and conference facilities. The hotel has a multi-cuisine restaurant and an in-house bar. Ambrosia Sarovar Portico is located on the Haridwar - Roorkee highway, near Baba Ramdevs Ashram and Crystal Water Park. The hotel is situated just 14kms from Roorkee Railway Station. Ambropsia Sarovar Portico serves with a total of 70 luxurious rooms. 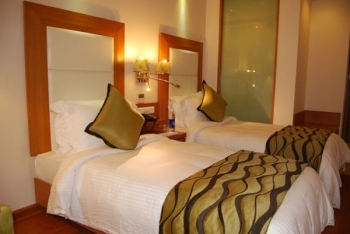 The hotel has 56 Superior Rooms, 10 Deluxe Rooms and 04 Executive Suite. The rooms are equipped with world class amenities like LCD televisions, A/C, In-room tea and coffee maker, direct-dial telephone, attached sanitized washrooms, electronic door lock, etc. Clove is a multi-cuisine restaurant at Hotel Sarovar in Haridwar overlooking the valley. It offers a-la-carte selection of Indian and international buffet meals. Bubbles is an in-house bar proving soothing ambiance and relaxing environment after a hectic day. Select from a choice of cocktails and extensive wine list at Bubbles. By Air: Jolly Grant Airport is the nearest Airport to Haridwar. It is situated 36kms from Haridwar. Taxis are easily available from Jolly Grant Airport to Haridwar. Jolly Grant Airport is well connected to Delhi with daily flights. Haridwar is well connected by motorable roads with Jolly Grant Airport. By Road: Haridwar is well connected with motorable roads. Haridwar is gateway to Shivalik range of Uttarakhand state. Luxury and normal Buses to Haridwar are available from ISBT Kashmiri Gate. Buses and Taxis to Haridwar are easily available from major destinations of Uttarakhand state. Haridwar is connected with National Highway 58.